This movie will make money. Have you seen it? When’s the release date? Oh boy! Half of me hopes it is excellent. The other half thinks it shouldn’t be attempted. Nope. It was a limited audience premiere screening at the Toronto Film Festival. Doesn’t go public until Sept. 23. 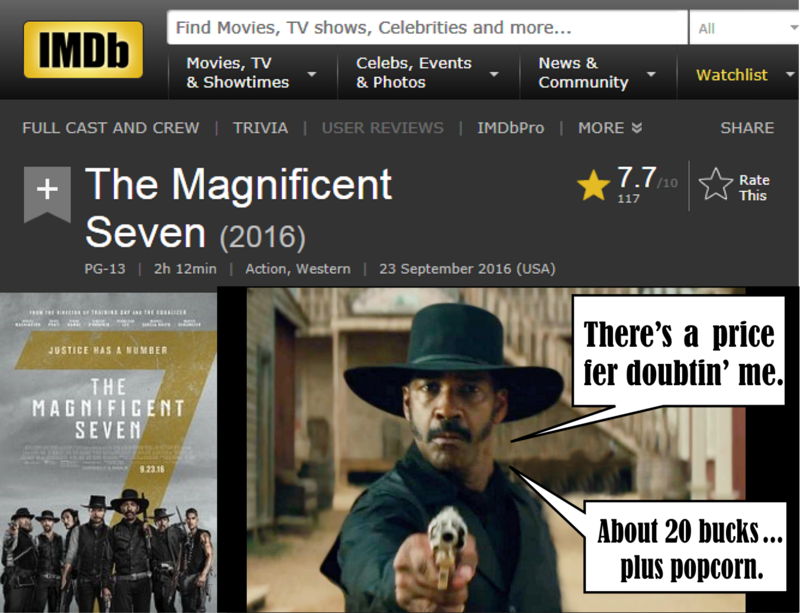 We all know it doesn’t have the Star Power (except for Denzel) of the original. But looks to be a totally different flavour of Western. The Reviews are strongly divided. Some hate, some love. Sort of difficult to get a sense of what one might expect. 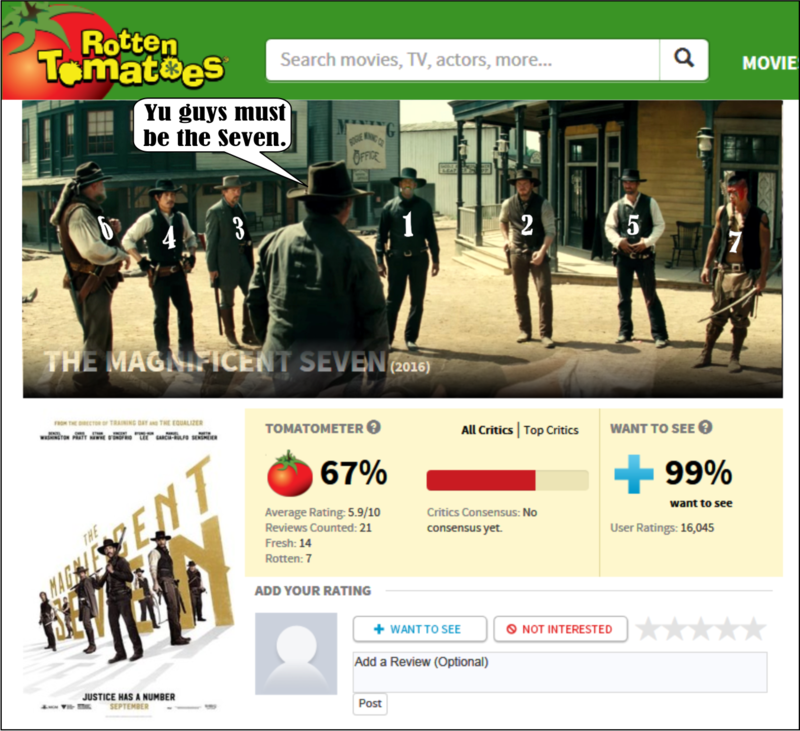 The Rotten Tomatoes review is interesting – Critic says “67%” and audience says “99%”. 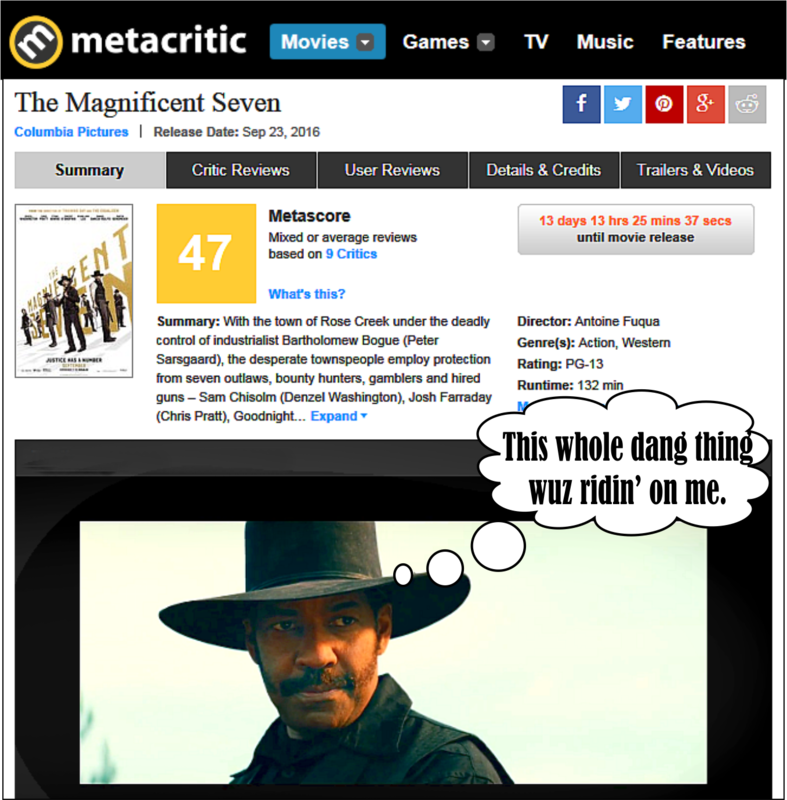 Metacritic’s average of all present reviews is “47%”. I’m guessing (since I don’t have high expectations) that I might be surprised. *shrug*. 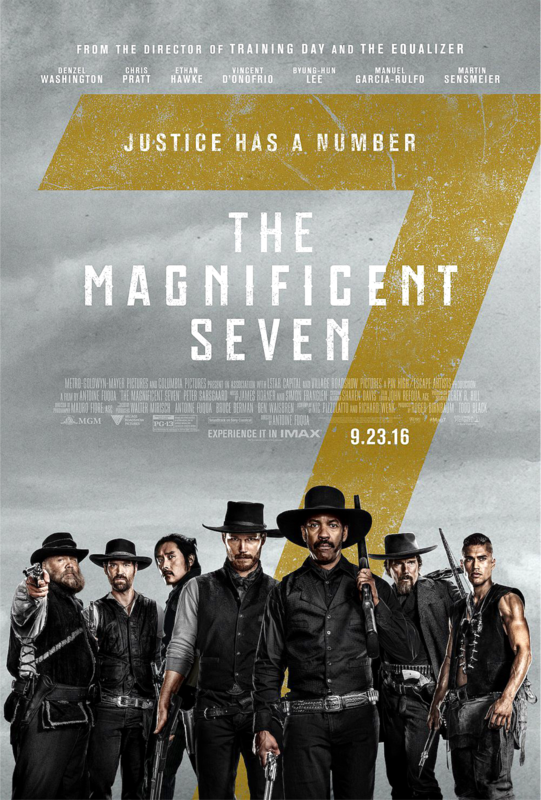 For free I might watch it, although I don’t know why there had to be a remake of a very good movie, the original Magnificent Seven anymore than the bomb remake of Stagecoach with Bing Crosby. Actually though the best ‘Magnificent Seven’, in my opinion, was Seven Samurai, a great Eastern. Yes – that was the inspiration that started these Westerns. My feeling about this movie – not having seen it yet – is that it’s not really a Remake – it follows the storyline somewhat – but can’t really attempt the magically elements that made the Original movie a Classic. The Classic had that incredible ensemble cast of Actors who all eventually became big Stars. Brynner was really the only real Star at the time. How that all came about I can’t say? But not likely to occur again. The old Studio film system made crafted movies – and discovered, tutored and developed Stars, Directors … etc They made junk too, but when they got it right they delivered great work. However, there might be a something good to come out of all this. Westerns haven’t done well for the most part in for quite a while but, if this movie is a big success, it might well inspire more Westerns – and some big name actors – to get involved. ?? Well … we all kinda doubt that. I mean I’ve the original many many times. That’s what makes a Classic a Classic. I will see this soon. Maybe if we don’t expect it to be a wonder, it might be enjoyable. ??? I’m slowly starting to look forward to this one. And I’m going into that cinema without the expectation of a remake and not making any comparison to the original. Will take it all from there. Agreed! Not expecting a Remake of the Classic is the way to go. Get your popcorn and enjoy the show.